The blooming season just goes on and on here. 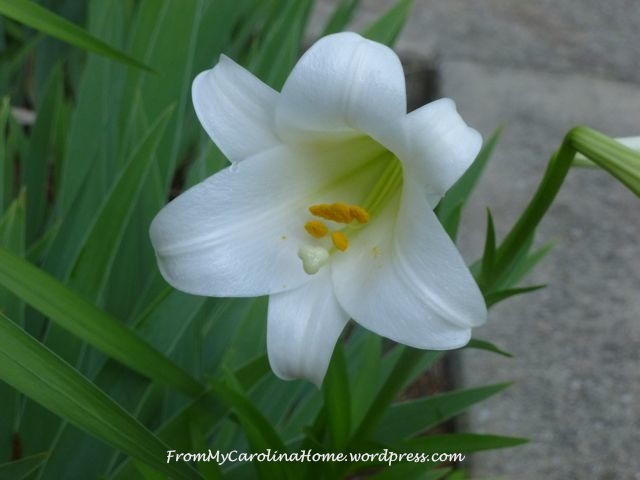 Two years ago I received a white lily around Easter and when it finished blooming, I put it in the garden. It bloomed last year and again this year. Although it is well past Easter! Last week two of the flowers were out. It has three beautiful white flowers now. 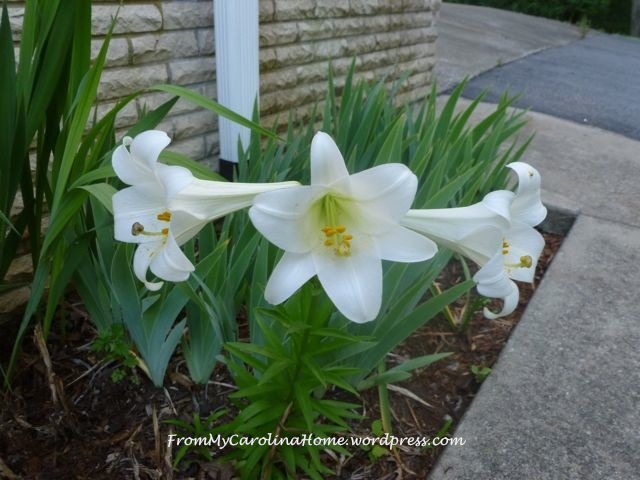 Easter lily about 2 months late, LOL!! 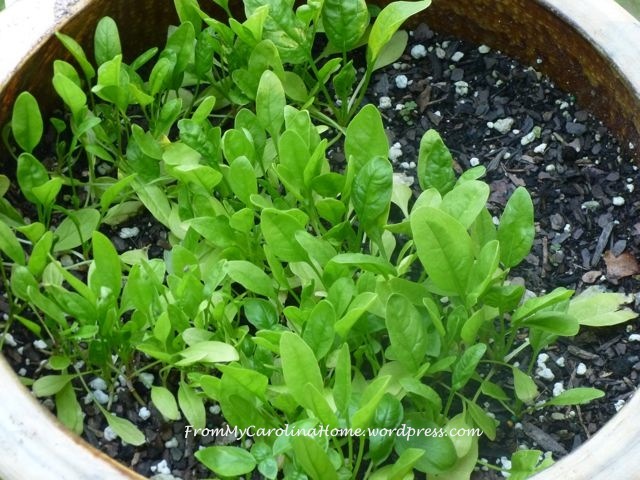 The spinach is coming along, I see a salad in the near future provided a bear doesn’t eat it like it did my lettuce crop 2 years ago. I have proof – on my Pinterest board bear pin. I have one little tomato. 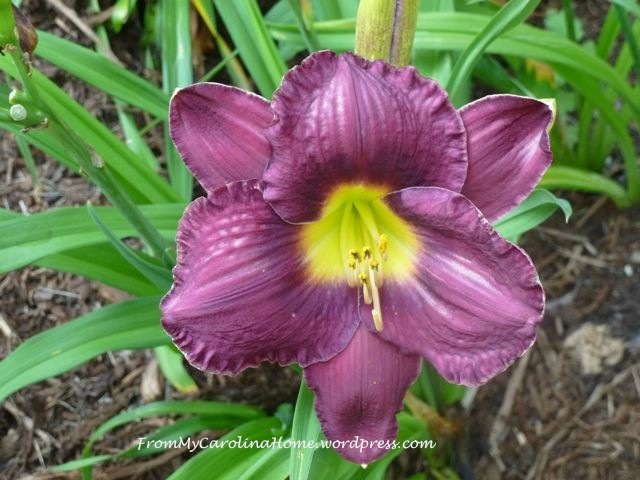 The purple day lily continues to bloom. The raised box with the two day lily plants is in full flower. 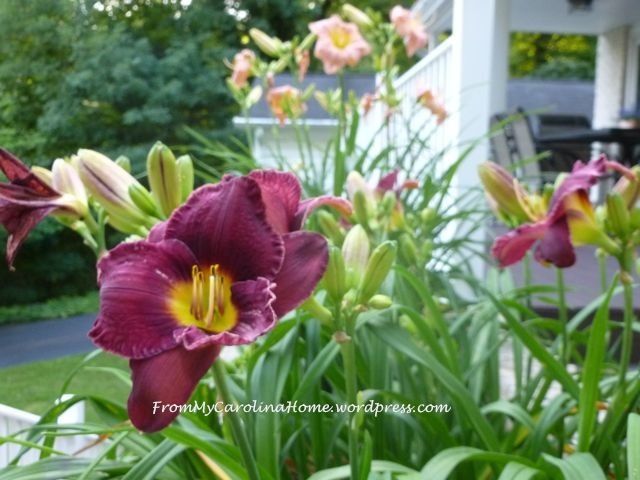 I have two areas with those purple day lilies. 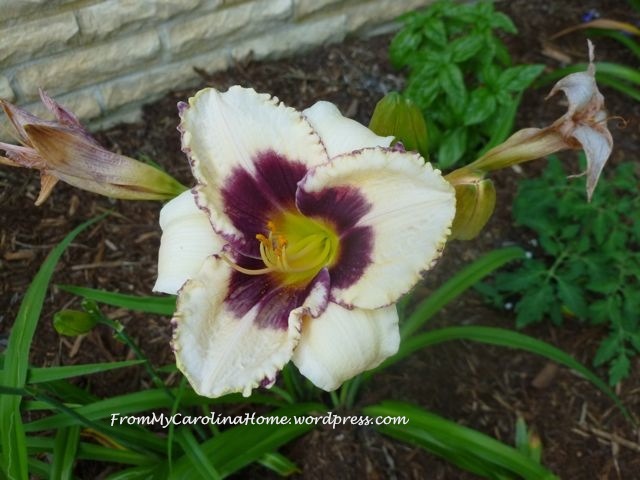 This cream color lily has a purple throat and a lovely ruffled edge with purple. Then there is a wonderful yellow day lily. It also has the ruffled edge in red. 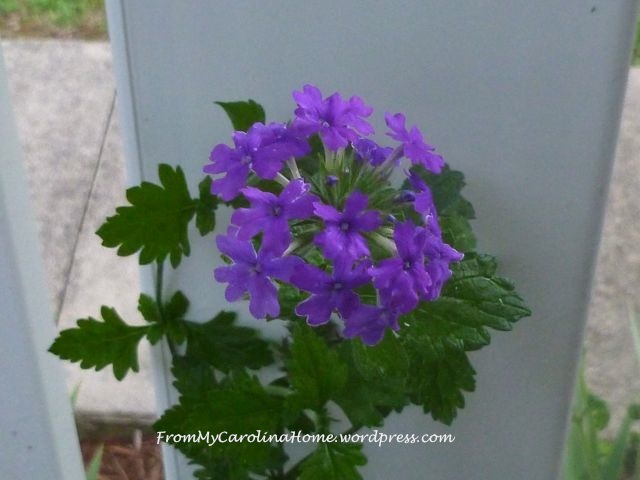 In the pots, the verbena has finally shown a cluster. 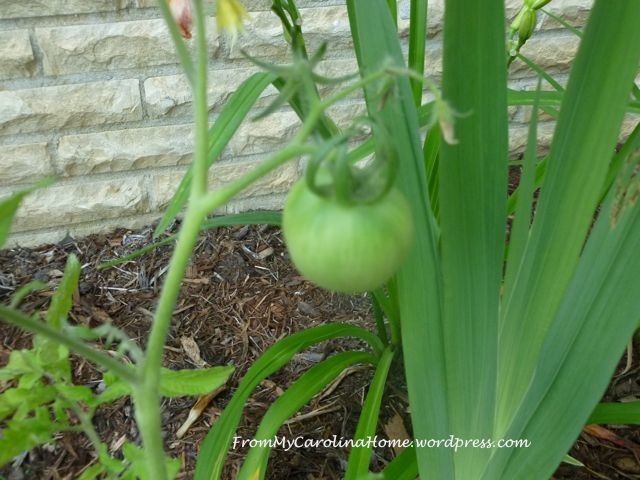 Hoping for lots of vegetables and more flowers… and no bear visits. Your flowers are absolutely stunning…so gorgeous! Love your flowers. 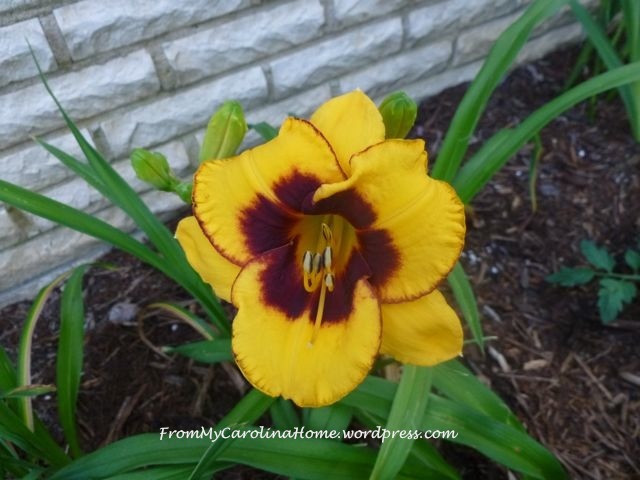 Do you know what variety the yellow daylily with the red ruffled edge is? I would love to have one! I am sorry to say I don’t know the variety. A friend got them all for me when she was going to a close out sale in another state. I gave her some money and asked her to get me a dozen daylilies. She brought back several varieties, and then while planting, my husband thought he’d be helpful and remove all the tags. Thank you! We can grow just about anything here, except roses. We have mild summers and usually just cold enough winter to snow a couple of times. Perfect four seasons, about three months of each. Roses though, take too much care to grow due to the bugs that eat them and it rains a bit too much.